J Chaturvedi, R Sachdeva, P Singh, J Savio, D P, B AM. Mucormycosis Of The Paranasal Sinus With Gas Forming Maxillary Osteomyelitis – A Case Report. The Internet Journal of Microbiology. 2012 Volume 10 Number 1. Mucormycosis (MM) is a deep, opportunistic mycosis caused by filamentous fungi included in the order Mucorales that belong to the class Zygomycetes of fungi. It is recognized as one of the most rapidly progressive lethal form of fungal infection in human beings with a high mortality of 70–100%. The term osteomyelitis designates inflammation of the bone and its marrow cavity. Osteomyelitis and Mucormycosis have been known to be associated with intraosseous gas collection. However these have never been noted in the paranasal sinuses. These gas-forming infections can be caused by strict aerobic or facultative anaerobic bacteria such as Klebsiella, Escherichia coli, Salmonella, Streptococcus, and Staphylococcus. Their coexistence with fungal infections can lead to dreadful complications. This report highlights a rare case of Mucormycosis of the paranasal sinuses in an immunocompromised man with associated gas forming osteomyelitis of the facial bones. This report also emphasizes on the importance of a prompt and early management in such a condition due to the rapidly progressing bony osteomyelitis with gas- forming organisms that are co-existent with fungal infections along with a review of relevant literature. Bone involvement as a part of Mucormycosis is most commonly seen with the rhino cerebral form. Involvement of other bones such as femur, spine and temporal bones has also been reported in literature.4 However emphysematous changes associated with Mucormycosis induced osteomyelitis is thought to be extremely rare. The presence of gas forming osteomyelitis of the maxillary bones due to Mucormycosis of the paranasal sinuses has not yet been reported in literature. We present in this report a case of Mucormycosis of the naso-orbital region in a known diabetic with gas forming osteomyelitis of the facial bones with a review of relevant literature. A 50 year old male farmer from a low socioeconomic, rural background presented to the emergency department of a tertiary referral centre in Bangalore, South India with a 10 days history of pain, swelling and progressive loss of vision in the right eye associated with a week long history of headache and facial pain. He was a diagnosed case of, poorly controlled, non insulin dependent diabetes mellitus (NIDDM) since 8 years on irregular treatment with oral hypoglycemic drugs. On clinical examination there was facial fullness over the cheek bones bilaterally. They were tender on palpation along with facial soft tissue crepitus. On Anterior rhinoscopy extensive foul smelling blackish crusts over the floor of the nasal cavity along with septal perforation involving the anterior part of the cartilage was seen. The oral cavity showed extensive erosion of the hard palate which was covered with foul smelling slough. A detailed ophthalmological examination confirmed total internal ophthalmoplegia with complete loss of vision and proptosis of the right eye. The left eye however maintained a normal visual acuity. Blood investigations revealed elevated blood sugars (280mg/dl) and low serum potassium levels (3.4Meq/dl). Urine ketone bodies were present significantly and the Arterial Blood Gas (ABG) analysis indicated a state of severe uncompensated metabolic acidosis. Nasal crusts were sent for microbiological investigation. Potassium hydroxide (KOH) preparation of the sample revealed thick aseptate fungal filaments strongly suggestive of zygomycosis (Fig-1). Fig-1. Potassium hydroxide (KOH) preparation of the nasal crusts showing thick aseptate fungal filaments suggestive of zygomycosis. A contrast enhanced computerized tomography (CECT) of the paranasal sinuses (PNS) revealed bilateral extensive PNS infection with features suggestive of bilateral maxillary bony osteomyelitis with multiple air filled pockets. A nasal septal perforation with mucosal ulcerations was noted on the nasal septum and the hard palate. Extensive inflammation of buccal mucosa on both sides was present along with involvement of the soft tissue of the pterygopalatine fossa. Orbital cuts revealed bilateral orbital cellulitis with the right side being more affected than the left along with right optic nerve sheath inflammation (Fig-2). In view of multiple air pockets a possibility of an anaerobic infection was suspected along with the working diagnosis of Mucormycosis with facial osteomyelitis. He was posted for an endoscopic debridement of the crusts within the nasal cavity under general anesthesia. Intra-operatively, abundant black foul smelling crusts and necrotic tissue was found over the floor of nasal cavity, lateral wall and the septum. The cartilaginous part of nasal septum showed extensive necrosis along with a perforation. Minimal cheesy material was evacuated from within the maxillary and ethmoidal sinuses on both sides. A bilateral Maxillary antrostomy, anterior and posterior ethmoidectomy was performed endoscopically. The Lamina propria was opened on both sides. 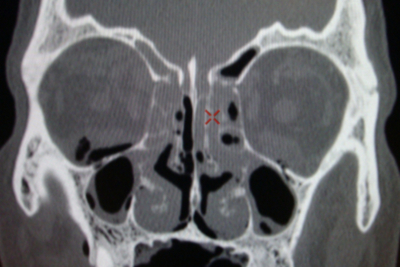 Bilateral inferior turbinectomy was also carried out in view of the extensive necrosis and a formal Septoplasty was also executed. Following this the hard palate was also debrided. Pus and mucosal tissue from the maxillary antrum was sent for a repeat microbiological and histopathological evaluation. The Gram’s stain revealed numerous gram negative bacteria and a few gram positive cocci. Aerobic culture yielded Escherichia coli sensitive to carbapenem and amino glycosides. No pathogenic organisms were isolated on anaerobic culture. A Mycological workup included a KOH staining, calcofluor- white staining and culture of the tissue and pus sample. 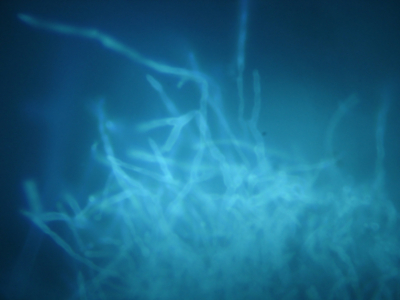 Broad aseptate fungal filaments were seen on KOH/calcofluor examination. Culture on Sabarauds Dextrose agar yielded grayish white cotton candy like colonies. These isolates were identified as Rhizopus species. 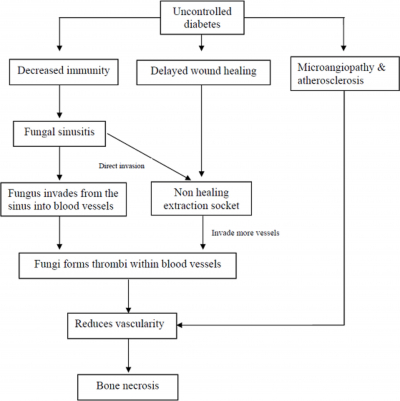 Histopathological findings confirmed evidence of fungal infection especially zygomycosis associated with vascular invasion and extensive osteomyelitis of the bony fragments (Fig-3). Fig-3. 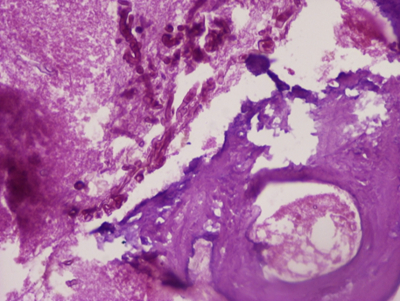 400X Haematoxylin and eosin stain of the tissue obtained after endoscopic debridement shows features of fungal infection by zygomycosis with evidence of vascular invasion and osteomyelitis. Also seen are abundant gram positive cocci and gram positive bacilli. Post operatively patient was treated with intravenous Amphotercin infusion in 5 percent dextrose solution at 50 milligrams per day for a total dose of 2 grams which was completed in 6 weeks. Care was taken to avoid exposure of Amphotercin to sunlight and the intravenous drip set was adequately covered. Serum potassium levels were monitored to look out for hypokalemia. Blood sugars were maintained with subcutaneous insulin administration and oral hypoglycemic agents. Weekly nasal endoscopy and removal of crusts was performed along with saline nasal douching. Antibiotic coverage for gram negative bacteria and anaerobes was added and he was administered intravenous metronidazole along with third generation cephalosporins. He responded remarkably to the treatment and attained complete recovery after 2 months of monitoring and medications. Vision improved immediately after surgery and reached normal visual acuity by one month. He was followed up monthly over the next 6 months to observe for any recurrence of disease. Follow up included monthly diagnostic nasal endoscopy, vision tests and three monthly KOH for nasal secretions which were subsequently negative for fungal disease. Table 1- Relationship between predisposing condition and the resulting predominant site of infection. The initial symptoms of rhino cerebral Mucormycosis are consistent with either sinusitis or periorbital cellulitis that include eye or facial pain and facial numbness, followed by the onset of conjunctival suffusion, blurry vision, and soft tissue swelling. Fever is variable and may be absent in up to half of the cases. If untreated, infection usually spreads from the ethmoidal sinus to the orbit, resulting in loss of extra ocular muscle function and proptosis. Marked chemosis may also be seen. The infection may rapidly extend into the neighbouring tissues if not treated at the earliest .7 Our patient presented with acute symptoms of headache, facial pain, swelling and progressive loss of vision. The examination findings of blackish slough in nasal cavity and oral cavity were suggestive of fungal infection. The bilateral tenderness and crepitus found over cheeks was unusual and indicated some form of gas accumulation within the bones. Since zygomycosis is not gas-forming1, this infection might not have been from a direct result of a fungal infection. An associated infection with a gas forming bacteria was considered at the time of diagnosis as bone necrosis caused by secondary bacterial infection in necrotic tissue is a possibility. Zygomycosis (ZM) is reported to cause osteomyelitis of skull bones 3, tibia10, cuboidal bones 8 and vertebrae 11 in immunocompromised patients. As it spreads through the perivascular spaces, bone destruction is an uncommon and late finding in ZM even when the surrounding tissue is extremely involved.8 In our patient hhistopathological examination of the tissue biopsy revealed evidence of fungal infection by Zygomycetes associated with vascular invasion and extensive osteomyelitis of the bony fragments along with abundant gram positive cocci and gram positive bacilli. The pus Culture indicated the presence of abundant Escherichia Coli. Till date Mucor has been associated with gas formation only in case of emphysematous gastritis2, where it occurred along with other gas forming bacteria such as Escherichia coli. The imaging findings of rhino cerebral Mucormycosis on CT and MR imaging are diagnostic. These include soft-tissue opacification of sinuses with hyper dense material, nodular mucosal thickening, and an absence of fluid levels in the maxillary, ethmoidal, frontal, and sphenoid sinuses, in decreasing order of incidence. Sinus contents have a variety of MR signal characteristics, including T2 hyper intensity or marked hypo intensity on all sequences, possibly secondary to the presence of iron and manganese in the fungal elements. Typically, proptosis occurs because of enhancing soft-tissue masses crowding the orbital apex and the cavernous sinuses. Thickening and lateral displacement of the medial rectus muscle are characteristic of orbital invasion from disease in the ethmoidal sinuses .Lack of enhancement of the superior ophthalmic vein or ophthalmic and internal carotid arteries may be seen and is related to vasculitis and thrombosis.3 In our patient a contrast enhanced computerized tomography (CECT) of the paranasal sinuses (PNS) revealed bilateral extensive PNS infection with features suggestive of bilateral maxillary bone osteomyelitis with multiple air filled pockets. This finding is not common for Mucormycosis of the paranasal sinuses. The diagnosis of zygomycosis almost always requires a histopathological evidence of fungal invasion of the tissues. Obtaining a fungus in culture from a potentially infected site is rarely sufficient to establish the diagnosis of Mucormycosis because the causative agent is ubiquitous, may colonize normal persons, and is a relatively frequent laboratory contaminant. This report highlights a rare case of Mucormycosis of the paranasal sinuses in a relatively young diabetic with associated gas forming osteomyelitis of the facial bones in a very short duration of just 10 days. It most importantly emphasizes the need for an immediate intervention and management in such a case keeping in mind the possibility of a rapidly progressing bony osteomyelitis that can augment the precipitation to fatal intracranial and intraorbital complications in a much unexpected and rampant manner. Conventional treatment regimes with amphotericin and newer antifungal medications do not usually include simultaneous coverage specifically for gram negative gas forming bacteria and on many occasions surgical debridement is deferred if patient is mildly symptomatic. If the osteomyelitis is left untreated, it allows for the fungal infection to invade deeply as necrotic bony tissue is a rich nidus for further infection leading to dreaded complications at a much faster rate. Hence the need for evaluation for co existent gram negative bacterial infection and its subsequent management with surgical debridement along with a multi-disciplinary team approach to identify early complications and sequelae is strongly recommended. 2. Koklu E, Akcakus M, Torun YA, Tulpar S .Primary Gangrenous Cutaneous Mucormycosis of the Scalp in a Child. Pediatric Emergency Care. 2008 Volume 24, Number 2. 3. Garcia BM, Guimera MN, Noda A, et al. Primary cutaneous mucormycosis: a diagnosis to consider. J Eur Acad Dermatol Venereol.1999; 12:258-262. 4. Chan LL, Singh S, Jones D, Diaz EM. Imaging of Mucormycosis Skull Base Osteomyelitis. AJNR Am J Neuroradiol.2000;21:828–831. 5. Nitaya Ma, Cesar V R, John W R. Osteomyelitis secondary to cutaneous Mucormycosis. Am J Dermatopathol 1984 6: 479-481. 6. M Karanth, P Taniere, J Barraclough, J A Murray. A rare presentation of zygomycosis (mucormycosis) and review of the literature. J Clin Pathol 2005;58:879–881. 7. Auluck A. Maxillary necrosis by mucormycosis. A case report and literature review. Med Oral Patol Oral Cir Bucal. 2007;12:E360-4. 8. Brad S, John E, Ashraf I. Novel Perspectives on Mucormycosis: Pathophysiology, Presentation, and Management. Clinical microbiology reviews. 2005;18(3):556–569. 9. R Chaudhuri, B McKeown, D Harrington, J D Spencer. Mucormycosis osteomyelitis causing avascular necrosis of the cuboid bone: MR Image findings. AJR. 1992;159: 1035-1037. 10. Tomoaki K, Atsushi F, Kazuya T, Naoki K, Kazuhiko S, Sadatoshi O. Enlarging Vertebral Body Pneumatocysts in the Cervical Spine. AJNR Am J Neuroradiol.2003; 24:1707–1710. 11. Holtom P D, Obuch A B, Ahlmann ER, Shepherd L E. Mucormycosis of the Tibia: A Case Report and Review of the Literature. Clinical Orthopaedics & Related Research. 2000 ;381:222-228. 12. Putcharoen O, Suankratay C. Salmonella Gas forming Femoral Osteomyelitis and Pyomyositis: the First Case and Review of the Literature. J Med Assoc Thai 2007; 90 (9): 1943-7.